This is a comprehensive guide the wool industry and the trading mechanisms involved in this vital business. The supply chain is examined, from sheep farming through to final garment manufacture and supply. The patterns of trade are explored, together with the various international arrangements that are associated that are associated with the wool trade. 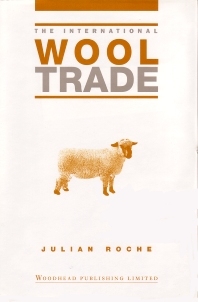 The book goes on to explain the theory and practice of trading in the futures markets and the associated regulation, and looks at the players, both wool companies and other institutions. The final chapter covers competitors to wool, such as man-made fibres and cotton, providing an analysis of current international trading patterns and looking to the future for this essential commodity. The history of wool production; The production of wool; Wool consumption; World wool supply; Wool prices; The wool trade; The workings of the wool trade; The players in the international wool trade; The international woollen industry; The future of the international wool trade.